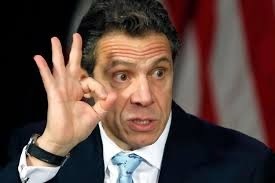 The Stark Raving Viking: Billions of Tax Dollars Misappropriated, NY Gov Andrew Cuomo, ripe for Maximum Prosecution? Billions of Tax Dollars Misappropriated, NY Gov Andrew Cuomo, ripe for Maximum Prosecution? Image was [found here] with New York Post story called, "Andrew Cuomo’s fracking ‘cone’ job". Warning: If angry taxpayer foul language offends you, turn back now. while they steal billions of your tax dollars, enrich themselves, their families, and fund black operations to destabilize the country and put police officers in harms way to further the international police union power, aims, budget of evil, and their UN Agenda 21. Do you want to accept the total screw job you are getting, or do you want to do something about it? Well, it is prosecution time for scumbags and corporate/banker whores like Cuomo and Hillary Clinton, right? Call, write by snail mail, email all of your local, state, and federal elected officials and let them know how you feel. So few citizens do all 3. So, if you do, you have the weight of 100,000 who do not even bother. Stark Raving Viking video uploads and favorites are [found here]. Lt. Alaric Fox, who commanded Troop C in Tolland, is responsible for your troubles Stevieboy. Why don't you talke about him? Are Chain Hotels helping Police Spy on You?